Ljubljana (lyoo-blee-YANN-uh, also loo- or lib-) has been around since ancient times — first as the Roman city of Emona over 3000 years ago. 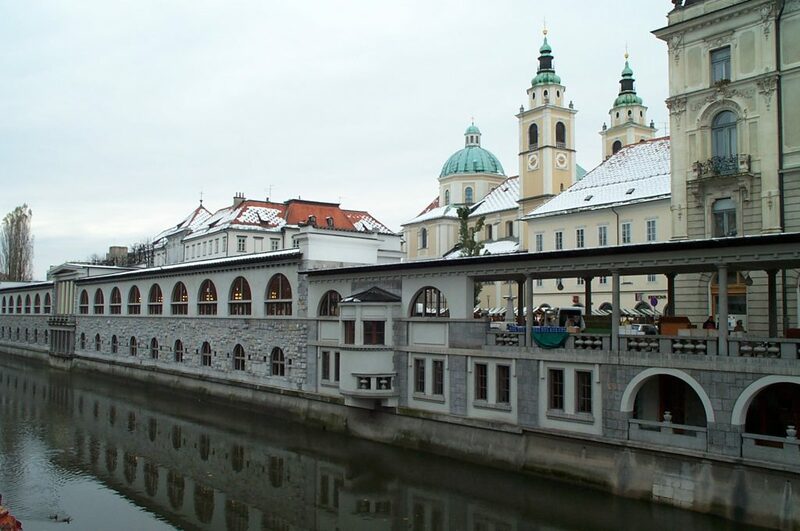 Situated around a tight bend in the Ljubljanica River and near its junction with the Sava, Ljubljana sat at the crossroads of the ancient north-south passages to the Alps and Balkans and the east-west route to the Adriatic. Thus, as the territory now owned by Slovenia has changed hands continuously over the years, Ljubljana has always figured prominently in the region. With Slovenia’s newfound independence, Ljubljana was the obvious choice to be her capital. The Frančiškansa cerkev, the bright red Franciscan church, is the most prominent feature in the center of the city. It stands over Prešernov Trg (PRESH-er-noff TERG), named after a famous Slovene author (see below), and the Tromostovje (troe-moe-STOVE-yuh), or the three bridges leading to the main marketplace. Prešernov Trg is a major junction of pedestrian shopping streets and a bus and taxi station. 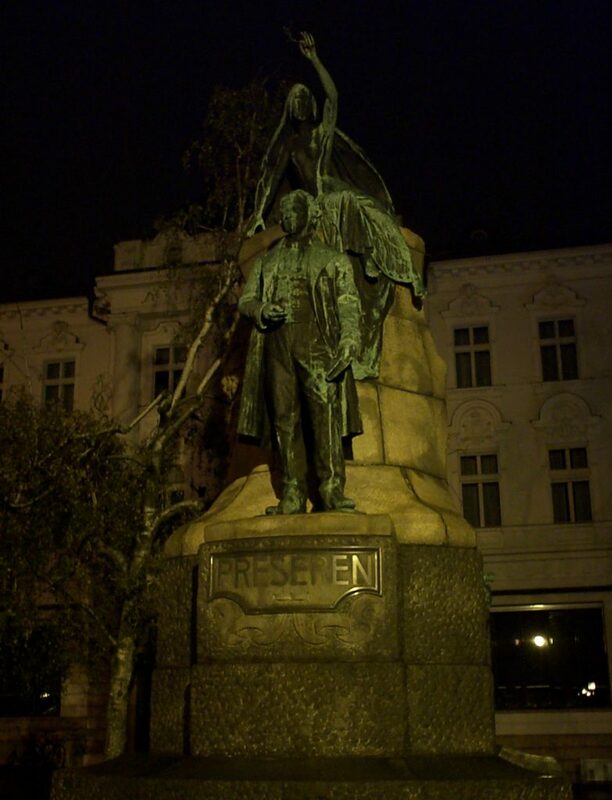 The statue of Prešeren is seen facing the circle with a muse holding a wreath over his head. Across the river is the Stolnica (stohl-NEET-suh), or Cathedral, looking over the marketplace. The row building on the river is the Galleria, a beautifully-columned Romanesque building where one can buy his daily supplement of bread, meat, and cheese. Outside were numerous souvenir stands, all temporary. 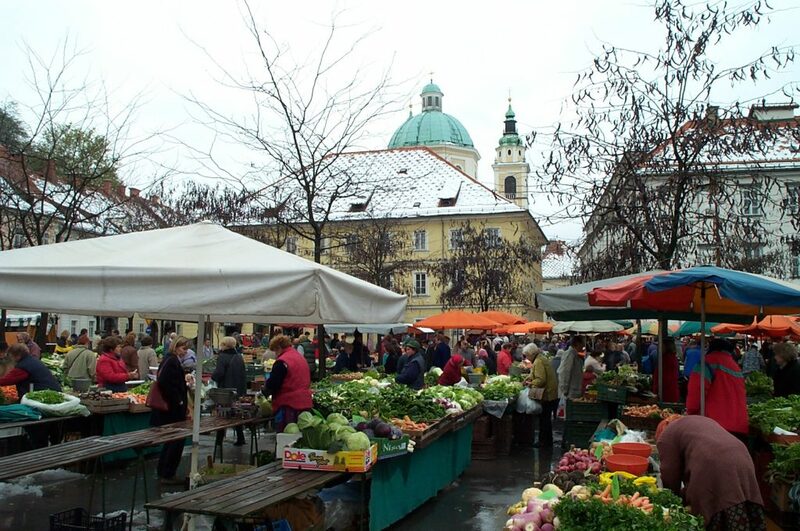 The permanent market across the street ranks among the largest I’ve ever seen, (but at least as of 2001, Ljubljana had not yet developed the same level of western chains as I saw in other countries — Slovenia as a whole developed much more in the years since). This was where all the fresh vegetables and fruits were sold, along with most clothing (shirts, shoes, etc.). This was taken on a Saturday morning, and the crowd easily numbered in the hundreds, scattered over several blocks. To be sure, Ljubljana has developed a main street that carries western Europe fashions, and it was common to see Ljubljana University students wearing the latest and greatest. Old Ljubljana, which is the western bend of the river, has most of these shops. Ljubljana also has many great sights. 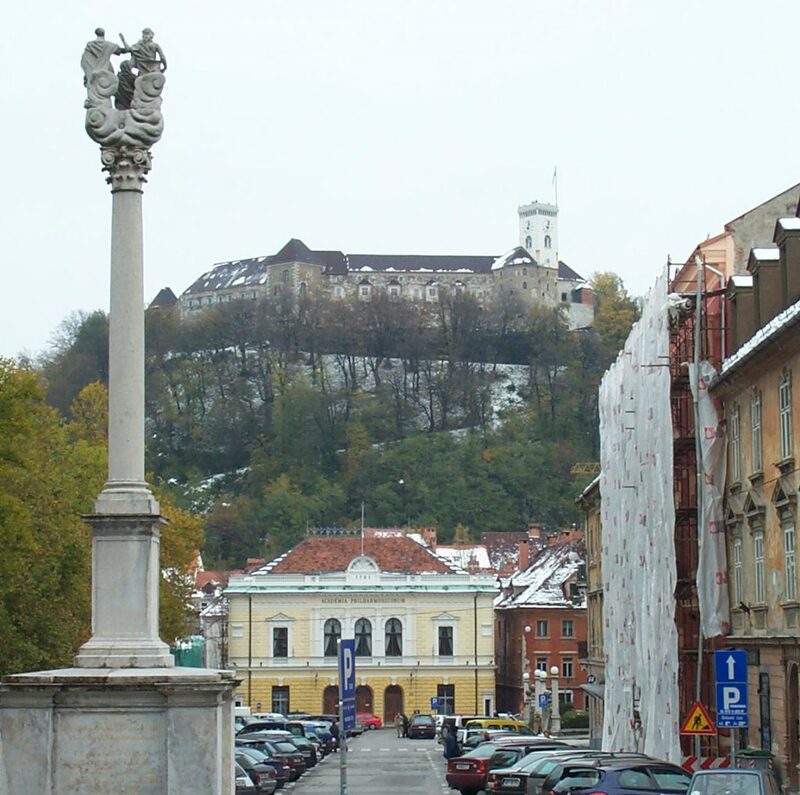 The below picture shows the Ljubljanski Grad (Castle) overlooking the Filharmonija (Philharmonic building). The trees on the left marked an X-shaped park built during Napoleon’s rule over the city, and hidden to the right is the main University building. The Grad is a wonderful City Museum. For only a couple dollars, you not only can wander through the castle and enjoy a great view of the city from the tower, you can also take a ‘virtual’ tour through Ljubljana’s history. In a 3-D theater, you are shown an educational animated video that presents the history behind many of the city’s prominent buildings and squares. Highly recommended. Ljubljana has a lot of bars and cafés, but not a tremendous number of restaurants — probably because the students dominate the nightlife. 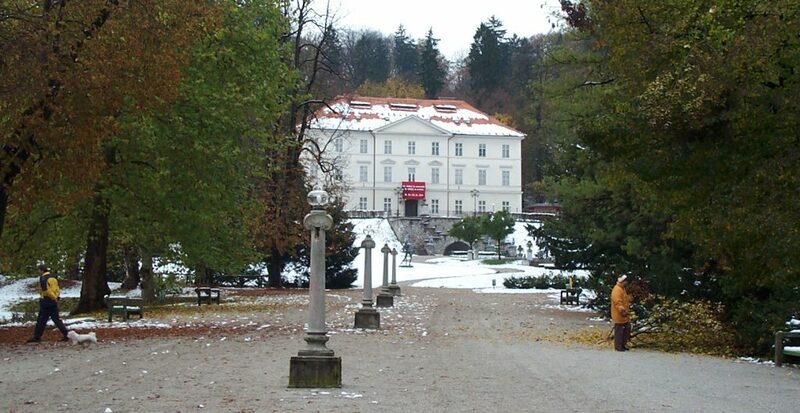 On the western side of the city, one comes upon Tivolski Grad and Tivoli Park, a massive park bordered by the southern borough of Vič and the Pivovarska Union (Union Brewery) to the north. Several of the city’s grander buildings are on the Tivolska cesta crossing the face of the park. Though empty on this cold November day, one can imagine this park being filled with sun-worshippers in the summer. Further south, on Mirje cesta, look for a section of the wall that once surrounded Emona. It’s amazing that after 3000 years so much of its remains. I was greatly impressed by the city. Its people are friendly, its streets are mostly clean, and its a great city to look at. I have places it on my short list of places to return to some day. Click here for a special story about my experience at Slovenia’s World Cup 2002 qualifying playoff match against Romania, played in Ljubljana during my trip!